Here are some photos of our Legazpi Trip in 2008. We stayed at Hotel Venezia. We got the Php 5,000 3d2n package that includes breakfast and roundtrip airport transfers. They even assisted us in checking-in prior to departure. We just gave them our e-ticket and they will arrange everything in the aiport so that you won't have to take the long queue. You may check out http://www.hotelvenezia.com.ph/ for more details. Hotel Venezia is a boutique hotel in Legazpi City. from the area, you could already see Mt. Mayon. The room is posh and sophisticated. It has a mini bar and flatscreen tv, coffeemaking facilities and a veranda. The bathroom is small but gorgeous. It is so clean. Caffe San Marco is Hotel Venezia's inhouse restaurant that serves Breakfast, Lunch and Dinner. That time they also have grill all you can at night. Breakfast in Caffe San Marco will really make your day. They have an omelette station where you can have your omelettes whichever way you want it. They also have delicious daing and longganisa and even congee! We were very lucky to have a glimpse of Hotel Venezia's sister resort - Discovery Bay Misibis in Cagraray Island. During that time, the resort is still under construction so we weren't able to swim in the pool, and there is no resto yet. Also, the weather did not permit us to take a dip on the beach. This is the clubhouse, still under construction. The villas have a breathtaking view of the sea. When you wake up, it's really gonna be "Good morning sunshine!" It has big beds, a mini kitchen, a bath tub. really nice villa perfect for a honeymoon getaway. The sand in Discovery Bay Misibis is not as white and as fine as Boracay's. It's totally different. The sand is more of coral in color and coarser than Bora's. they also have beachfront cottages. The next day, we went on a city tour. We rented the hotel's van (around Php 1,000). First stop: Lignon Hill. From Lignon Hill is a nice view of Legazpi. Too bad, Mt. Mayon (at my back) is covered by clouds because of the bad weather. We also went to Daraga Church. 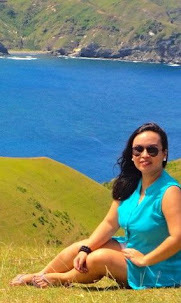 Next time I'll be in Bicol, I'll visit Cam Sur, Calaguas and Caramoan. whoa, how did you score this Php 5,000 3d2n package? amazing!